We made it to Munich, (Munchen to the Germans) a wonderful city. We are staying in a small town near the train route about 15 km. from Munich. It is the winter home of a very nice couple who are kind enough to let us use it for our stay. We took the train to downtown Munich and wandered the pedestrian area around the Marienplatz (the main square) and watched the Glockenspiel do it's thing. 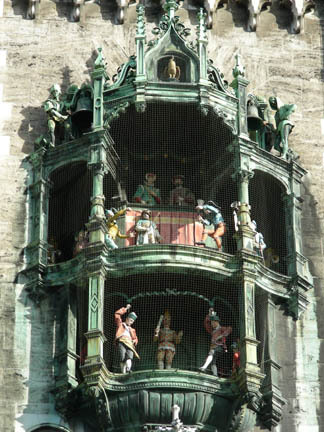 Several times a day the huge clock in the town hall performs. It plays music and has carved figures that dance and joust. The knight that always wins the joust is the one from Bavaria. After the Glockenspiel we went to the Hofbrauhaus, the famous beer house that all tourists are required to go to (just kidding). this is one of the places to get the huge liter mugs of beer that one sees in all the tourist shows. 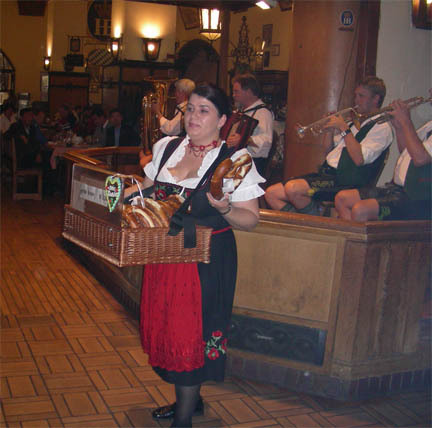 There was an "Oompah Band" and a lady selling pretzels. This is where Hitler did some of his recruiting for supporters while he was still an unknown revolutionary. He was arrested and jailed for a year and we all know what happened from there. 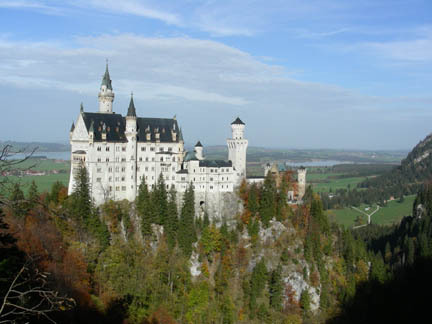 For many years the area in the south of what is now Germany was its own kingdom, Bavaria. 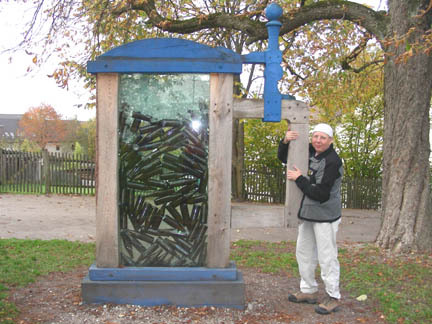 It was ruled for a couple hundred years in the 16-17th centuries by a family called Mittlebach. (Florian, if I get anything wrong please forgive me, I'm running on memory from two weeks ago!) This family ruled from their house in Munich called the "Residenz". Their house (palace) is open for tours and the decorations boggle the mind. The Rococo decorations are so prolific that any detail is lost in the totality of it, and it is done in a such a detailed way that the artistry is gorgeous when one looks close at it! The floors are inlaid woods making intricate designs. 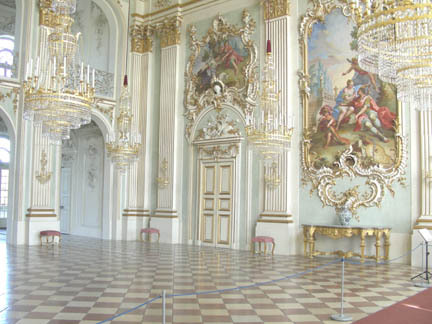 The walls and ceilings have ceilings are covered with huge frescoes and paintings. 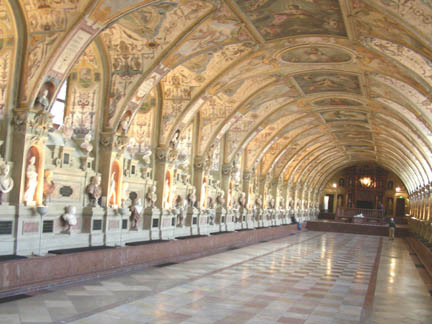 The columns, walls, doors, doorways, and ceilings are decorated with carvings and moldings covered in gold. The chandeliers are of gold and crystal with dozens of candles each. The furniture is of the carved and convoluted style of the French kings of that time. It is all too much to appreciate. The people living there, both the ruling family and the staff must have ignored most of it, it is overwhelming. The picture to the right is a hall that was built just to show off their collection of Roman busts. Most of these statues and busts are life size. If you look close you can see Kathy in the right side of the far end. This room was huge! 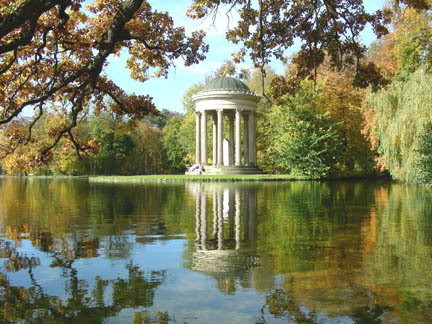 And then they had their country house at Nymphenburg, now enclosed within Munich, but several kilometers away from the Residenz. It is even bigger and more decorated. The main entrance was stunning (I'm running out of adjectives). It was as stunning as the Residenz, only much bigger. Behind the main house was a reflecting pool, like the one in Washington DC. This one was a kilometer long and about a hundred meters wide with a waterfall at the far end. The ground rose about 10-12 feet from the house to the far end of the pool. The pool had been dug out of the rising ground to make it level, a huge undertaking when you consider it was done by hand. Along the pool were places to sit and contemplate, like this marble structure. It had a bigger-than-life-size statue inside. There were also some smaller palaces on the grounds. 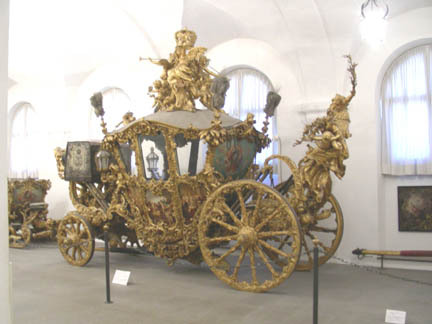 The carriages we saw in the museum in Lisbon were decorated in a style that was popular in the 14 & 15th centuries, the ones here from the next two centuries were even more decorated. They had to have been horrid to drive, but you looked good coming down the boulevard. This family had the power and the money! We took a day trip on the bike to the nearby Alps and visited some more castles. 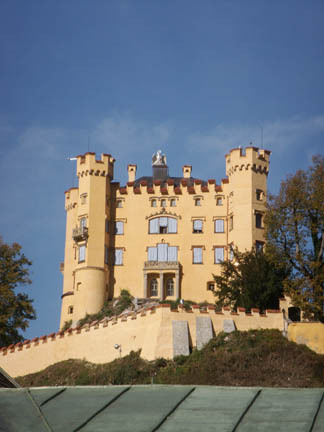 These are truly castles and not just the palaces of the Mittlebachs. and then built Neuschuanstien on a nearby hilltop. He was on a building boom and this was one of several he built and had more planned. He died after spending only 6 months in this castle. He was declared to be insane, arrested and confined in another castle on a nearby lake. The next day he and his psychiatrist were found floating in the lake, dead! Was it an accident or murder? Nobody knows. 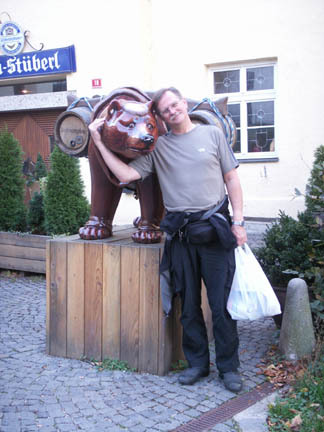 but that was alright because when we had traveled to the town of Freising I had hugged the "beer bear". Freising has the oldest brewery in the world. It is just over 1000 years old and still making beer at its hilltop site. Right next to the School of Agriculture, which must be handy for those college students. After a week in Munich we looked at the weather report, it said sunshine and good times in Venice, even if it was going to be cool. We decided to head south through Austria and the Alps.